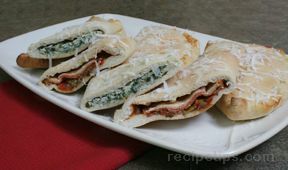 Savory calzone bursting with flavor. Great as an appetizer or light meal. Place dough on a floured surface. Roll out to form a 12 inch circle. Spread pesto over 1/2 of the dough. Layer sausage, sweet red peppers, basil and mozzarella cheese over pesto. 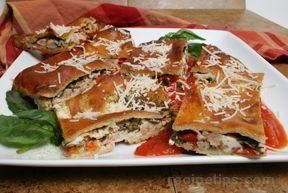 Fold the dough over the filling and pinch the edges to seal the calzone. Make 3 cuts across the top of the calzone approximately 1 inch long. Brush with an egg wash and bake for 20-25 minutes or until golden brown. Spoon marinara sauce in the center of the plate. 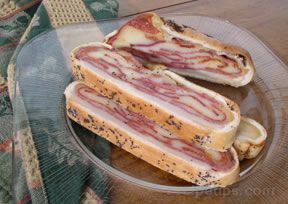 Slice calzone in half or in strips and place over sauce. Garnish with grated parmesan cheese and more chopped red pepper if desired. 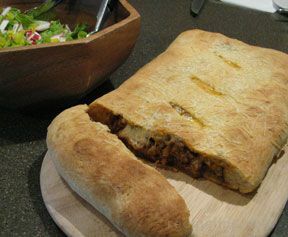 "This was pretty good homemade calzone. I thought it looked harder to make than it was but I used store bought pesto and used 2 cups of shredded Mozzarella cheese rather than fresh."